For maximum safety, we recommend using the Sirona Z in a rear-facing position for as long as possible – from birth to 105 cm (from 45 cm to 18 kg, to approx. 4 years). Physicians, accident researchers, and consumer and health organizations recommend transporting babies and toddlers in rear-facing car seats. In most countries, car accidents are still the main cause of death for children older than 1 year of age. However, if children are transported rear-facing beyond Group 0+, the risk of injury is mostly stable in Group 1. This can be seen in statistics from countries with predominantly rear-facing transport in Group 1, such as Sweden. It is important to consider the anatomy of babies and toddlers in the event of an accident. Unlike adults, a child’s head is quite large and heavy in proportion to their body, and accounts for about 25% of their total body weight. However, the neck muscles and the spine of a child are not yet fully developed. That is why they need particular support and protection in an accident. 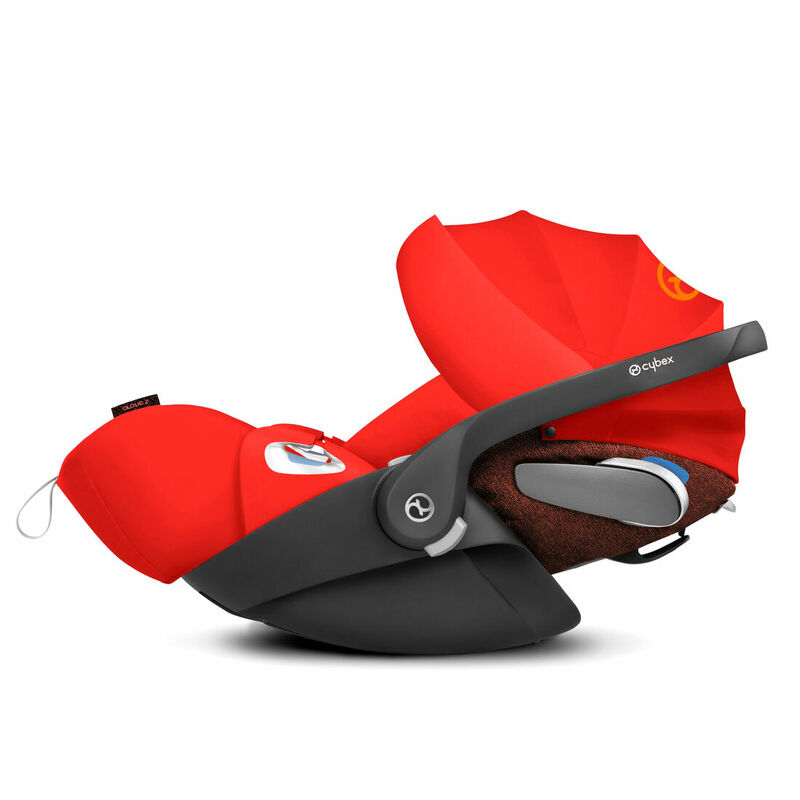 CYBEX developed the Sirona Z to provide infants and toddlers with maximum safety in the car. In an accident, the Sirona Z acts like a protective shield, especially protecting the neck and spinal area. The impact forces are distributed over the large area of the shell. This significantly reduces strain on your child’s neck, shoulder and head as well as their inner organs. Therefore, the Sirona Z greatly reduces the risk of physical injury in a frontal collision. Rotation Mechanism with Driving Direction Control: The innovative 360° rotating mechanism makes it easier to get your child in and out of the car, ensuring less strain on your back. It can be easily adjusted from rear- to forward-facing without having to remove and reinstall the seat. The Driving Direction Control (D.D.C.) provides added safety by preventing forward-facing use before your child has reached the minimum age and size requirements (at least 16 months old and 76 cm tall). Evidence has shown that the lateral space of a vehicle is limited and does not guarantee protection within the crumple zone. This means that the car seat must provide the most protection in a side-impact collision. That’s why the CYBEX Sirona Z features the L.S.P. System, an adjustable side-impact protection system that increases safety in both rear- and forward-facing positions. The door-facing L.S.P. System folds out to reduce the force created by a side impact by 25%, passing it through the energy-absorbing shell and away from your child. Smooth Adjustment – One-Hand Recline Adjustment: For a restful slumber in the car, the Sirona Z offers 5 rear-facing upright and recline positions and 3 forward-facing upright and recline positions. Its 12-step height-adjustable headrest provides even more comfort. The one-hand upright and recline adjustment mechanism is quick and easy to use. ONE-HAND RECLINE AND ROTATION FUNCTION: The smart one-hand recline and rotation function makes it easy for parents to adjust the seat while keeping one hand free. For comfortable sleeping and traveling, the Sirona Z car seat offers 5 reclining positions when rear-facing and 3 reclining positions when forward facing. TWO-CLICK INSTALLATION WITH ISOFIX: A two-click installation with ISOFIX allows for simple installation and guarantees increased safety. In combination with the Base Z the car seat is secured using the car's ISOFIX system and requires no further fastening. An installation indicator also helps to prevent a possible misuse. MODULAR SYSTEM: Stay flexible – as part of the Z-Line Modular System, the Sirona Z and the Cloud Z both fit onto the Base Z for a continuously safe ride from birth up to 105 cm, approx. 4 years. REAR-FACING CAR SEAT FOR REARWARD FACING TRANSPORTATION UP TO 105 CM, APPROX. 4 YEARS. (Alternatively forward facing from 16 months and 76 cm up to 105 cm): A rear-facing car seat reduces the risk of injury in a head-on collision by more than 80% when compared to a forward-facing system car seat. Tests show that the force of an impact during a front crash is distributed evenly over a large area. CYBEX recommends rear-facing travel for children up to 105 cm, approx. 4 years. 5-POINT HARNESS SYSTEM: Secure your child in the Sirona Z with ease, thanks to the central 5-point harness system. ENERGY ABSORBING SHELL: The energy-absorbing shell of the Sirona Z absorbs the forces of an impact and protectively covers the child. REBOUND BAR: The integrated rebound bar of the Sirona Z offers increased protection in the event of a rear collision. BELT HOLDER: The belt holder makes taking your child out of the seat easy.